Look what Larry found! While shopping the Habitat ReStore, ReStore Bookkeeper Larry Callan spotted a 16-foot-long solid oak church pew. In his mind he instantly began reenvisioning its potential. What he saw were the makings of the perfect dining room table. With some DIY magic, Larry began reconfiguring the pew by cutting the 16-foot pieces in half. Larry assembled the table top by gluing together the pieces and reinforced the joints with dowels. 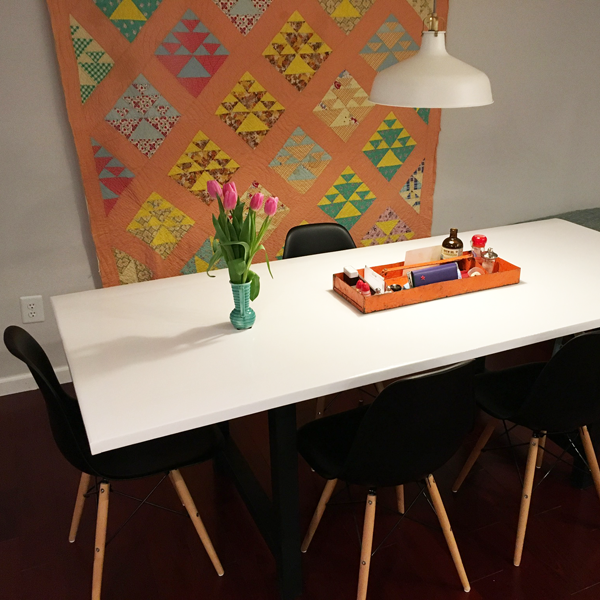 After bracing the new table top, he added end caps to the raw edges, then sanded, primed, sanded again, and finished off the surface with two coats of high-gloss, durable marine paint in Polar Ice. Larry added custom-made steel legs--and ta-da! Six MCM retro chairs purchased locally in the St. John's neighborhood created the perfect pairing. Don't you just love it? Get inspired at The ReStore! THIS BEAUTY WILL LAST FOR YEARS AND YEARS!